What will happen to my navel piercing during and after pregnancy? During pregnancy the length of the navel piercing will stretch and flatten, but the gauge (or thickness) will not stretch. Some women with healed piercings have successfully worn jewellery throughout their pregnancies. In other cases the ridge of the navel expands and flattens so much as to make the jewellery uncomfortable. PTFE or Bio compatible jewellery can be more comfortable than metal because it is softer and more flexible. After delivery the navel will return to its original shape but the skin may be loose and in some cases the piercing may sag. If the piercing is still healing it is unlikely that the piercing can be maintained as the stomach enlarges the pressure could easily cause the piercing to reject. Infection must be avoided as a serious infection could travel to the interior of the abdomen and possibly affect the pregnancy or the baby. In the interest of maintaining good health and reducing risks that could affect your pregnancy, it is very important to wear the correct jewellery and ensure that the piercing is regularly cleaned. Navel wash is a product which can be purchased from JoBananas aftercare section and is suitable for daily cleaning. Women who have had children usually do not have a risk of the piercing migrating or rejecting because the skin has been stretched. 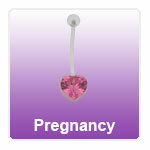 What jewellery do you recommend during my pregnancy? Either PTFE or Bio compatible belly bars are suitable. We offer PTFE in lengths up to 30mm and Bio in lengths up to 19mm. While your bump is growing you should allow an extra 4mm length to allow for growth and comfort. Your belly bar should not become too tight, if it does you should consider buying a larger length. You can always cut it down afterwards for use after the baby arrives!